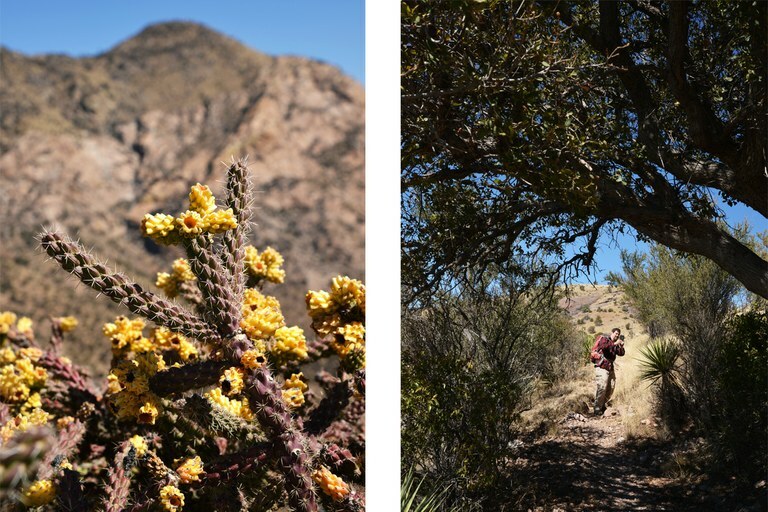 One early March morning in southern Arizona’s Coronado National Memorial, an uneven line of scientists and amateur naturalists in floppy hats and hiking pants crept up a steep hillside through yellowed grasses and dark shrubs. Plant names – scientific and common – flitted through the cool air, as the group covered the terrain, moving at the pace of lichen. The dry winter suppressed plant growth, making for challenging botanizing. “Any ideas on this little guy here?” one participant asked, pointing to what appeared to be a leaf emerging from parched soil. “I just put, ‘It’s green?’ ” his companion replied. Kevin Weitemier uses the iNaturalist app to identify bladder pods during the Border BioBlitz at Coronado National Memorial on March 3. The group was there to spend the day cataloging the plants and animals along approximately four miles of undulating desert grassland. Nine other teams were doing the same thing on either side of some 500 miles of the U.S.-Mexico border, from Baja California to western New Mexico, along with one team in Texas’s Santa Ana Wildlife Refuge. It was the first Border BioBlitz organized by N-Gen, a professional network of Sonoran desert researchers. More rigorous and thorough field studies would be needed, but this was a necessary first step toward a baseline, said Myles Traphagen, a biogeographer at the nonprofit Wildlands Network, who organized the BioBlitz. If border wall construction goes forward, these experts can watch and record what that means for the ecosystems being bisected. 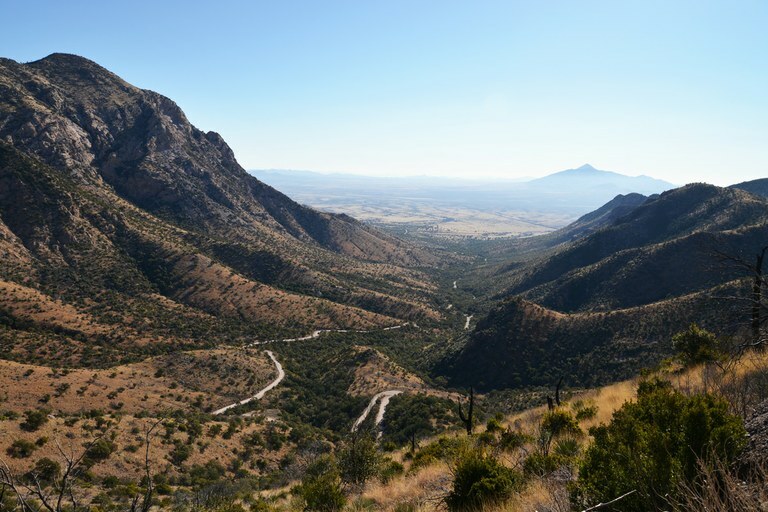 Southeastern Arizona — at the intersection of the Rocky Mountains and Sierra Madre, the Sonoran and Chihuahuan deserts — is one of the country’s most biodiverse places. Since Coronado’s creation in 1941, biologists have found more than 900 species of plants and vertebrates in these seven square miles alone. 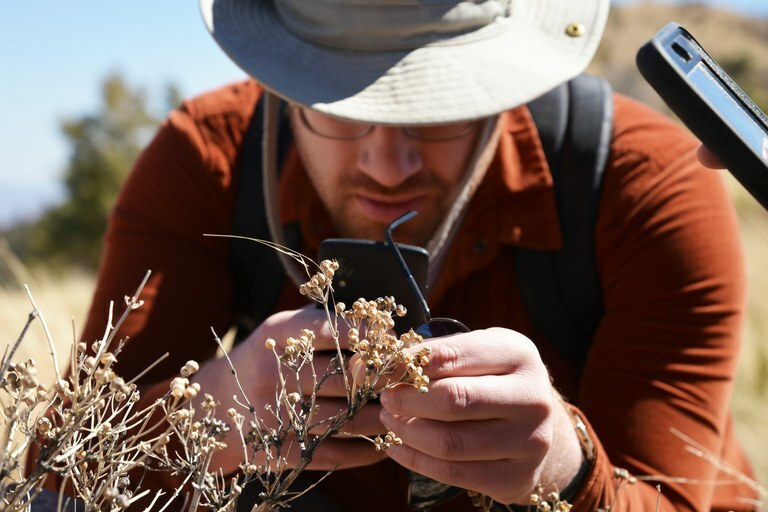 Herpetologist Taylor Edwards uses the iNaturalist app to identify a plant species along the Arizona Trail during the Border BioBlitz on March 3. Edwards didn’t expect to find any “herps” on this cool day. Instead, he wanted to see how the park has changed since his last survey. Back then, Edwards could walk up to a barbed wire fence and gaze into Mexico. Now, approximately half of that three-and-a-half mile international border is blocked by pedestrian fencing, with vertical metal bars that are more than 17 feet high and too close together for humans to slip through. Still, Edwards saw the day as a celebration of “the biodiversity of that really remarkable part of both of our countries.” It was also a chance to have fun, which for this group meant photographing hoverflies and poking through coyote poo. The BioBlitz had just been given more urgency: In February, a U.S. district judge ruled that the Trump administration could waive federal regulations and fast-track construction without environmental analyses, leaving no record of the ecological trade-offs being made for a border barrier. The federal spending bill, passed a few weeks after the BioBlitz, may force some environmental review, but in the end, studies like this may provide the only documentation of what was here before the wall. On a rocky hillside trimmed with cacti, the group found a small cave. Inside were what appeared to be the tracks of a young javelina traveling alone — strange, because javelinas generally live in family groups. “Maybe it was hiding from Border Patrol,” Traphagen remarked to a few volunteers, who laughed. A Cholla cactus grows along the Arizona Trail, left. Myles Traphagen photographs an Arizona white oak tree, right, during the Border BioBlitz event to take stock of the biodiversity in the area. N-Gen has not taken an official position on immigration policy, much to Edwards’ disappointment. He argues that poor immigration policy harms the Borderlands environment, and that scientists have an obligation to get involved. But other board members worried about the impacts of advocacy on federal employees and citizens of different nations. After months of discussion, N-Gen decided to keep its work science-oriented and let the BioBlitz serve as its response to the politicization of the border. 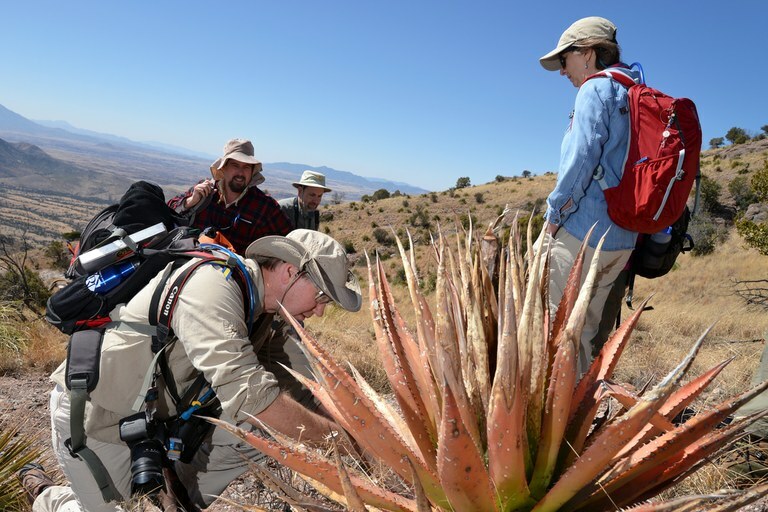 All the BioBlitz participants are desert devotees, but not all are professional scientists. Amateur birder Robert Weissler confided to me that he was drawn here from California 17 years ago by the bird diversity: Southern Arizona is “the hummingbird capital of the United States,” he said. More than twice as many species visit the region than most other places in the West. At the top of a rise, the group paused beneath the burned husk of a massive, 20-foot-tall alligator juniper and listened to the clear, high notes of a bird. “Rock wren,” Elaine Nakash, an employee of the U.S. Geological Survey’s bird-banding laboratory, said. “Canyon wren,” Weissler suggested, noting a discordant buzz in the wren’s sweet call. It lingered in the clear desert air long after the group moved on. The view looking to the east from the top of Coronado National Memorial shows the existing border wall in the distance where the landscape is not separated, but teeming with shared biodiversity.